Liquid oil bubbles up to the surface of Trinidad's Pitch Lake, the world's largest asphalt lake. Tiny habitats hidden within oil could expand the potential for life in the universe, researchers say. Scientists have discovered microbes living in microscopic droplets of water inside a giant asphalt lake on Earth, suggesting that alien life could exist within ponds of sludge on distant landscapes such as Saturn's largest moon Titan. Researchers investigated the largest naturally occurring asphalt lake on Earth, Pitch Lake on the Caribbean island of Trinidad. 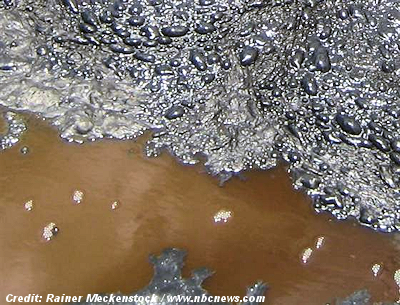 Black goo there oozes across roughly 114 acres (0.46 square kilometers), an area equivalent to nearly 90 football fields. . . .